I’ve bought loads of them, normally the £15 bargain basement type that last about a year before blowing up and taking the rest of the electrics in the house with them. It’s a false economy, because many cheap toasters equals one really quite good one that’ll last for years. Here’s a good example of a quality piece of kitchen kit that rises far above the mediocrity of the el cheapo kitchen appliance, but which won’t, at a shade over fifty quid, absolutely break the bank. 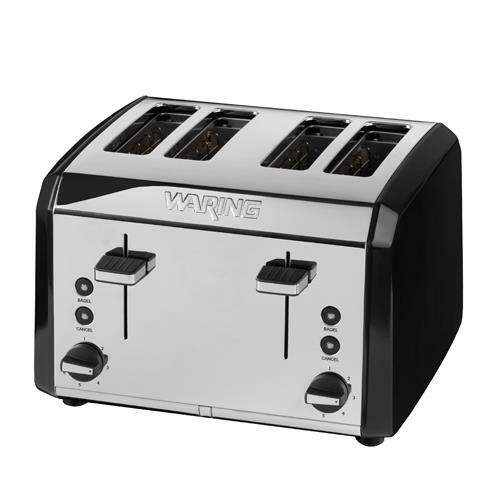 It’s by Waring, an American company with both feet firmly in the commercial appliance world, so you’d be right to expect that they know a thing or two about making gear that lasts, and that really shows in this toaster, the WT400 … it’s sturdy, solid, well-built and has a little bit of grunt about it. This particular Waring came from Argos, who have a wide range of toasters available. The commercial pedigree means that the WT400 is sleek and simple … there’s no room for anything that doesn’t just function in a working kitchen, and clean lines, no clutter, big handles, and wide toast slots are exactly what a busy kitchen needs. Four slots help, too, operating in pairs, so you’re not literally burning money heating two empty elements when you only need a couple of slices toasting. People need a gimmick, and a toaster is such a simple thing that there needs to be something to differentiate this one from the next. Toasters just toast, right? What more could there actually be to it? Waring’s gimmick is isn’t really a gimmick at all … it’s actually quite good. It’s a bagel setting that shuts off one set of elements in each slot, so that only the cut side of a bagel is toasted. This is a good idea – it leaves the bagel properly toasted on the cut side, and warmed through on the underneath. It means that the bagel has a crisp and doughy feel at the same time. It’s really how a bagel should be. Disclosure: this post is presented in collaboration with Argos. The opinions expressed here are mine and aren’t indicative of the opinions or positions of Argos.